The latest in a long line of promotional events, social game giant Zynga has partnered with Paramount to feature characters from the upcoming movie Rango in FrontierVille. 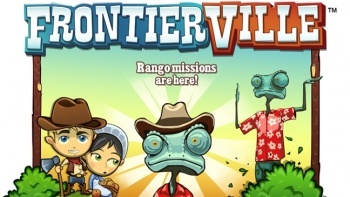 Starting February 28th and leading up to the film's March 4th release, 3 Rango quests will be added to FrontierVille and exposed to the upwards 15 million people who play it daily. The quests will involve spotting Rango himself hiding in the world, getting friends to send you buckets of water, and watching the trailer for the film. Complete all the quests, and you'll be rewarded an in-game Rango statue! Just what you always wanted, I'm sure. With this latest partnership, Zynga is continuing its push to be an important marketing partner to film and music companies everywhere. "We are continuously looking for new and innovative ways to create interactive experiences for our movie-going audiences," said Paramount's Executive Vice President of Interactive Marketing and Film Production, Amy Powell. "Given Zynga's proven success building fun and engaging games, bringing Rango to FrontierVille seemed like a natural fit." As Rango takes place in a small western-style town and FrontierVille is set in the western frontier, the two "fit together naturally," said global director of brand advertising at Zynga, Manny Anekal. "The Rango campaign offers a fun way to interact with the film's characters while enhancing game-play within FrontierVille." You know, Rango and FrontierVille really do fit well together. One is an insane waste of time and money, and the other is an inane waste of money and time. This is less like getting chocolate in your peanut butter and a lot more like getting dirt in an open wound; painful and sometimes fatal to children.